We are proud of our employees. They are the best-of-the-best in our industry who each work as a team to provide quality bus shelter, rail station, out of home displays, and outdoor furniture solutions for communities across North America. From our designers to engineers, fabricators, welders, and more, our Tolar Team is world class. 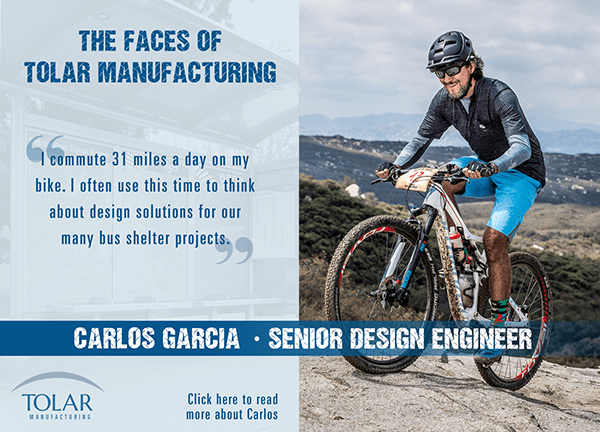 We thought it would be fun to get to know our employees in a feature we’re calling the, “Faces of Tolar.” First up is Senior Design Engineer, Carlos Garcia. Click here to Meet Carlos!